Today's Terrific Tuesday Giveaway is being sponsored by Ollie and Evie. Rhonda has an adorable Etsy shop packed with wonderful pre-cuts and beautiful yardage!!! And she has a great special on Shipping right now. Free Shipping for purchases over $50.00 with the code 50SHIPS!!! 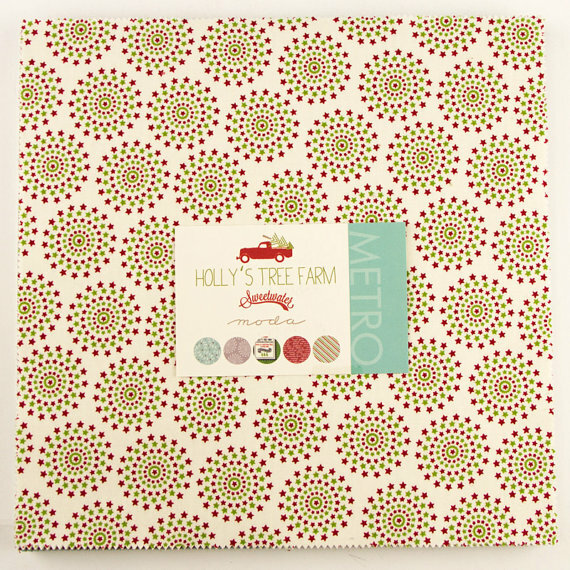 And the Terrific Tuesday Giveaway is for a fabulous Holly's Tree Farm Layer Cake!!!! Oh my, I just love this line by Sweetwater. And you know, only 179 days until Christmas is here. Time to get Holiday Christmas in July sewing!!! ENTRY 1 - Simply leave a comment that tells me if you plan on doing any Christmas Sewing in July and if so, what you are planning on making. A few weeks ago I was asked by the wonderful folks at Fat Quarter Shop if I wanted to make one of their new Joyful Jelly Roll Tree Skirt that uses Kate Spain's new Christmas line Jingle. I knew right away that I wanted to make this up for Barbara (my wonderful MIL and Binding Fairy ;) Kate Spain is one of her absolute favorite designers and she loves all things Christmas, perfect fit!!! When it came time to quilt mine, I decided to pass the baton. Barbar does amazing feathers, and since this was going to be under her tree, I thought she might like to quilt it up with her beautiful features. So we mapped out a plan and Barbara quilted it up. Didn't she do a fantastic job!!!! This so makes me want to practice my feathers more so I can do this!!! Barbara used a fabulous red and green variegated thread called Fantastico Christmas Chance. What a perfect match!!! 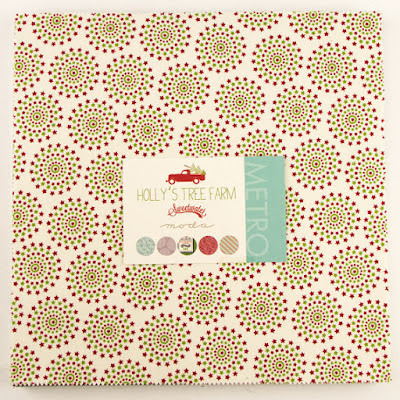 Fat Quarter Shop has Joyful Jelly Roll Tree Skirt Kits and Baking Sets available if you want to make your own using the same fabrics. It really is so much fun to make!!! Only 181 days until Christmas, I can't wait!!! Saturday I got to spend the afternoon at Pine Needles Quilt Shop in West Jordan, Utah. 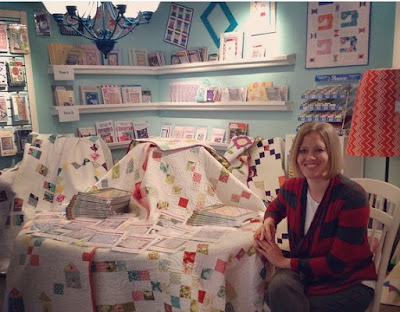 I grew up going to visit this shop, so it was so much fun to go back and do an Irish Chain Quilts book signing ;) Everyone at the shop was so nice, and it really is such an adorable shop!! If you are ever in the Salt Lake area, you should totally stop by!! Oh, and total side note, while I was in Salt Lake we stayed with my parents, and I might have had my mom chop my hair. Eeekk!! I have another book signing tomorrow at my cute local quilt shop here in Cedar City!! Kim McCallister runs Stitching It Up and I just love her shop!!! I am so excited to get to share my quilts and Irish Chain Quilts with all of my Cedar City friends. I will be at Stitching It Up on Friday evening from 5:30 - 7:30 signing books and sharing the fun on Irish Chain Quilts. So if you are in the surrounding area, pop on in and say hi ;) We are going to have a great time!!! 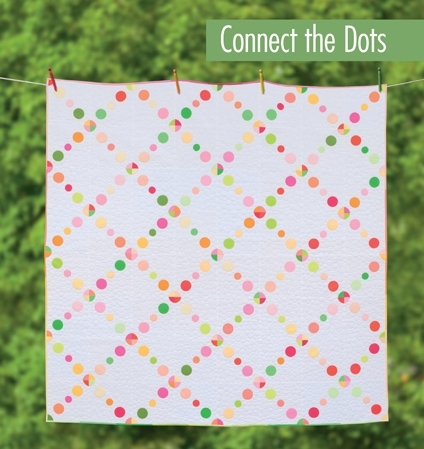 Goodness, after the Irish Chain Quilts Blog Hop, I feel like I am playing catch-up with the blog. I have so much to share with you from the last 2 weeks. 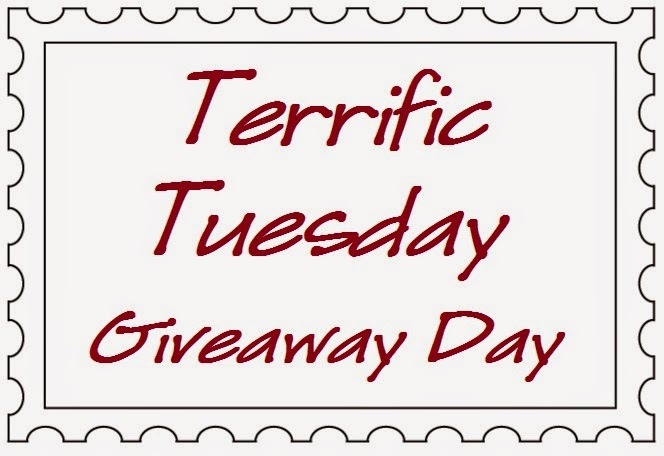 But first things first, Terrific Tuesday Giveaway Day is back after a 2 week Break!!!! 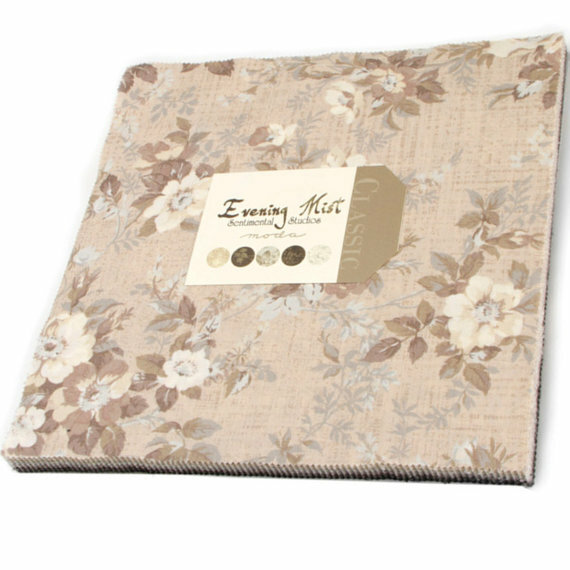 And the Terrific Tuesday Giveaway is for this gorgeous Evening Mist Layer Cake designed by Sentimental Studios for Moda. These prints are just so pretty!!! ENTRY 1 - Simply leave a comment that tells me what you love to do in summer?? So did you see the adorable new Sew Solid Quilt from Fat Quarter Shop??? 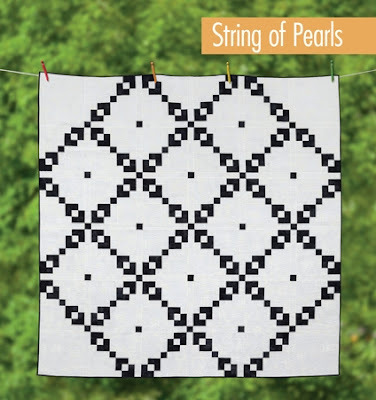 The pattern is called Panda-Monium (which you can download for free right here) and it is the next mini in the Sew Solids Series that Fat Quarter Shop is putting on!!! Isn't he just absolutely adorable!!!! Of course, I had to do mine with a purple background so he would match with my purple wall of mini's ;) This little mini goes together super fast and is so much fun to make!! And Kimberly made it even easier to put this little guy together with her fantastic video tutorial!!! She will walk you through each step of the way, so fantastic!!!! When it came time to quilt mine, I decided that I just loved the cross-hatching that Kimberly did on the original quilt, so I copied it. I used a disappearing marker to draw the lines 2" apart and then quilted on the lines using a soft grey. Wishing you a Happy Quilting Day!!!! Irish Chain Quilts Blog Hop - Wrap Up and Grand Prize Winners!!!! 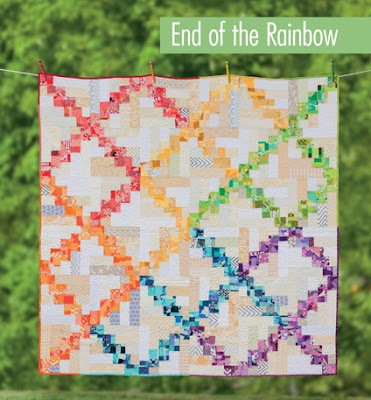 Well, all good things must come to an end right ;) Today is the final day of the Irish Chain Quilts Blog Hop. Thank You so much to everyone who stopped in each day. Your sweet comments and emails meant the world to me. It was so much fun to get to share the quilts of Irish Chain Quilts with you as well as the awesome Charity Quilt Blocks all of my wonderful friends made to go along with the quilts. And I know lots of you have been wondering how all of blocks were going to come together . . . well, wait no longer. Here it is!!!! Didn't it just turn out so adorable!!! I am going to call it Rainbow Remix. I just love how the chains all come together. 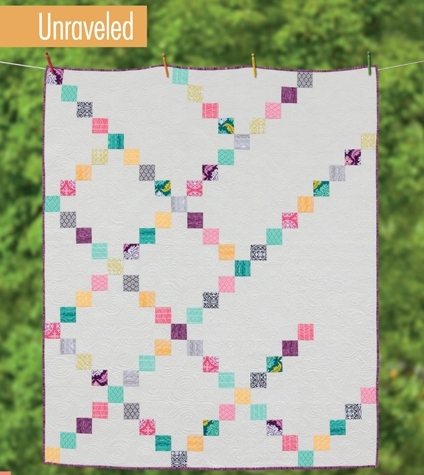 Even though they are all made out of different sizes and shapes, they still create an overall single Irish Chain quilt that is oh so cute!!!!! And this one really shows the quilting. I wanted to keep this quilt super soft and cuddly for it's recipient, so I opted to do a basic stippling stitch in the background in my favorite 402 So Fine thread that blended just perfectly with all of the different low volume backgrounds, and then arches in all of the chains. I matched the color thread to the chain color using fabulous vergitage Fantastico threads, which just made the chain pop all the more. So fun!!! On the petals of the daisy, I added everyone's name that has made blocks and participated in the blog hop. I think it is just the cutest finishing touch :) So special!! Thank you again to each of the ladies on this label, you are amazing!!!! And now it is all ready to be delivered to Primary Children's Hospital. I want to say a huge thank you to all of the ladies that helped in the making of this quilt!! I know it is going to be such a special little quilt for a special little child!!! And that leaves us with one last order of business. 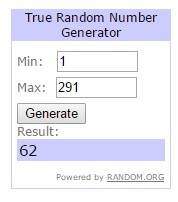 Announcing the Grand Prize Winners!!!!! 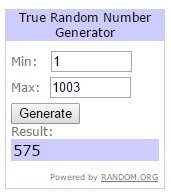 I had so much fun reading your Irish comments, and I was blown away by the number of entries. You all sure know how to make a giveaway fun!! So, let's get to this. Drumroll Please . . . . . . . . . . . . The first winner who will receive an Entire Bitty Bits Quilt Kit, comprised of 14 Kona Cotton Charm Packs, a Vanessa Goertzen Gooseberry Charm Pack, 2 Irish Green Fat Quarters from Denyse Schmidt's Moderns Solids collection, an Angela Walters Drawn Fat Quarter, a Bitty Bits Mini made by me, and a signed copy of Irish Chain Quilts is . 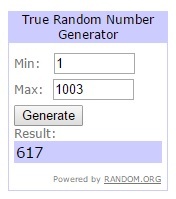 . . . . . . . . #617 who is Ginny!!!! The second winner who will receive a Lizzy House Butterflies Fat Quarter Bundle, and American Jane Lorraine Layer Cake, 2 Irish Green Fat Quarters from Denyse Schmidt's Moderns Solids collection, an Angela Walters Drawn Fat Quarter, a Bitty Bits Mini made by me, and a signed copy of Irish Chain Quilts is . . . . . #575 who is The Joyful Quilter!!!! Congrats to both of you ;) I have emailed you. I want to sign off and close this Blog Hop with one last Thank You!!! Thank you to my wonderful readers for your constant support of Happy Quilting ;) I so appreciate you popping in each day to share my quilting adventures. Your comments, emails, and and pictures always bring a smile to my face. Thank you, Thank you, Thank you!!!! I'ts Day 9 of the Irish Chain Blog Hop!! I hope you have been enjoying it, I know I have!!! An Irish Braid was one of the first designs I ever made. The original design is almost 4 years old, but it fit the book so well and has always been a huge favorite of mine, so it made it in ;) Even though this quilt looks super complex, it really is quite simple, using strip piecing and jelly rolls to really speed everything up. You can 2 patch your way to this beauty in no time. So fun!!! Isn't it just so adorable!!! I kept the houses free from quilting so that when I threw it in the wash they would get those fun scruffy edges. I just love it!!! This quilt will also be delivered to Primary Children's hospital and I am sure will be a wonderful surprise for a special little child!!!! Today is day 7 of the Irish Chain Blog Hop!! Let's get to it!!! 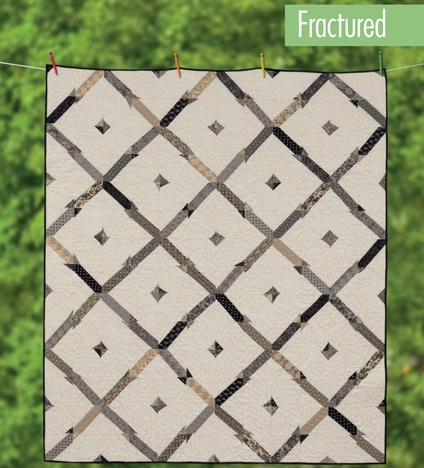 Fractured was such a fun quilt to make. If you are new to improvisational design this is such a great place to get started. 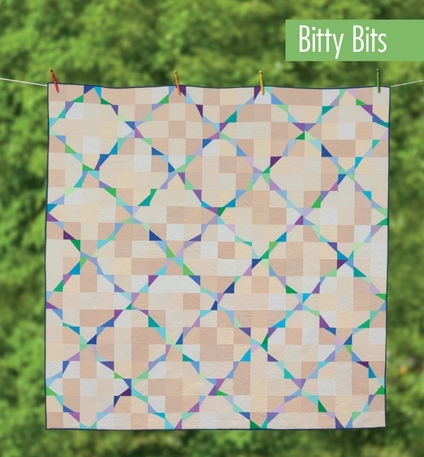 You have all the fun of wonky angles and corners, but still the classic X structure, making it a little easier for those of us, like me, that need a lot of balance in their wonky ;) And all you need is a layer cake to start, making this quilt go together super fast. So fun!!! Welcome back to the second week and day 6 of the Irish Chain Blog Hop!! I am so excited for another fun filled week of Irish Chains!!! String of Pearls is that classic Black and White quilt that I knew I wanted to include in the book. And I totally want to make a second one now in the reverse color layout. I am just in love with the big, bold, design of this quilt!! And I got a special little surprise in the mail the other day, turns out String of Pearls will be making a second debut in the Martingale 2016 Calendar. So fun!!! Daisy Chain has a special little place in my heart. 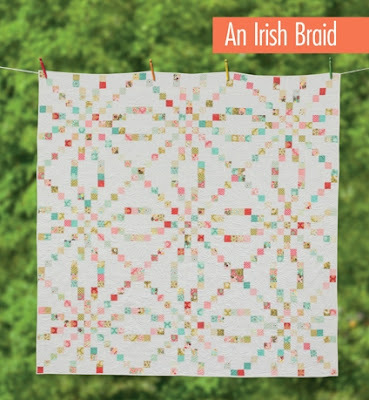 I explained earlier that the original concept of Irish Chain Quilts was inspired by the Double Irish Chain Quilt my mother made me for my wedding. So I wanted to create a design in the book that was special for her. My Mother was born in England and always shared wonderful stories of how she would sit out in the daisy fields for hours making Daisy Chain bracelets, necklaces and head garlands. So this quilt is a tribute to that memory from her childhood. 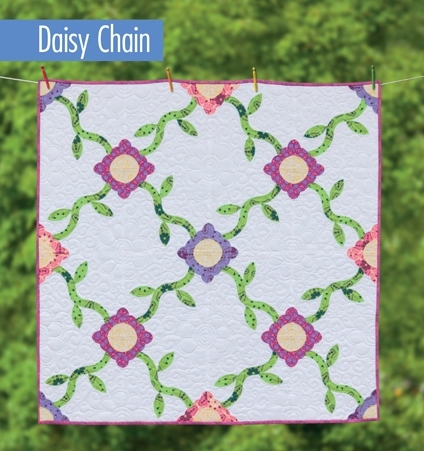 I love that Applique gave me the ability to create a chain that mimicked those daisy chains!! It's day 5 of the Irish Chain Blog Hop and it's Friday!!! Yippee for Friday!!! 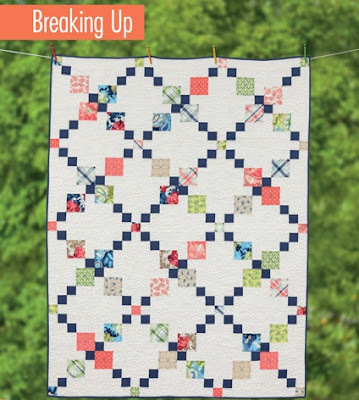 Breaking Up was actually the first quilt I designed for the book. It was also the first quilt that was sent off to the publishers for the book, so I guess you could call it the guinea pig of the book. I love the almost Argyle look it creates by using different size squares and playing with the placement of focal prints and solids. This is another great layer cake quilt or scrap buster. The Village Squares was such a fun quilt to put together. I know, lots of people get nervous when the word Applique is mentioned, but this is such a great design to dip your baby toes into the world of Applique. 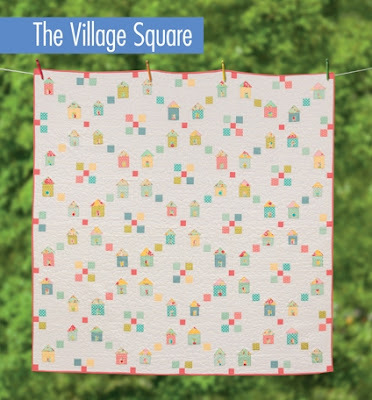 Since all of the appliqued houses are made of simple squares, triangles, and rectangles, you can still do all of the cutting with your rotary cutter, so fast. And secure stitching around straight lines is quick, fast, and fun and a great way to learn the technique. And in the end, you have a completely adorable finish and you have Appliqued! It's day 4 of the Irish Chain Blog Hop!! Are you just having so much fun!!! The North Star is such a fun quilt to make. I know, it looks a little complex but really, it is so very easy to put together. The entire quilt, including the sashing, is made using strip piecing so it really is super fast and super fun!! And if you are wondering why I call it The North Star, when I was making it up, I kept squinting when piecing the chains to get a quick idea of the overall color layout, one time while squinting, I noticed that the background secondary design created a pixelated 4 pointed star effect and there you have it, The North Star. Unraveled is a super easy and super fun quilt to make ;) I have to say, this was another one of those that made me push outside of my design comfort zone. I was an accountant before I was a mom, so I tend to like everything balanced, so the asymmetrical design was hard for me. But I have to say, I was so loving it the second I saw it all come together. And this is a design that you can really make your own, playing up the broken chain in any way you like.